Squishy and sticky, actually. But lumpy and squishy are a part of the family lore. When my almost 20 year-old son was very little, he was a picky eater. He’s not any more, but as a tyke, whenever he wouldn’t eat or even try a new food, his excuse was that it’s lumpy and squishy. So lumpy and squishy became our go-to phrase when we don’t like or want to eat some particular food. …is lumpy and squishy. But try it? You betcha!! 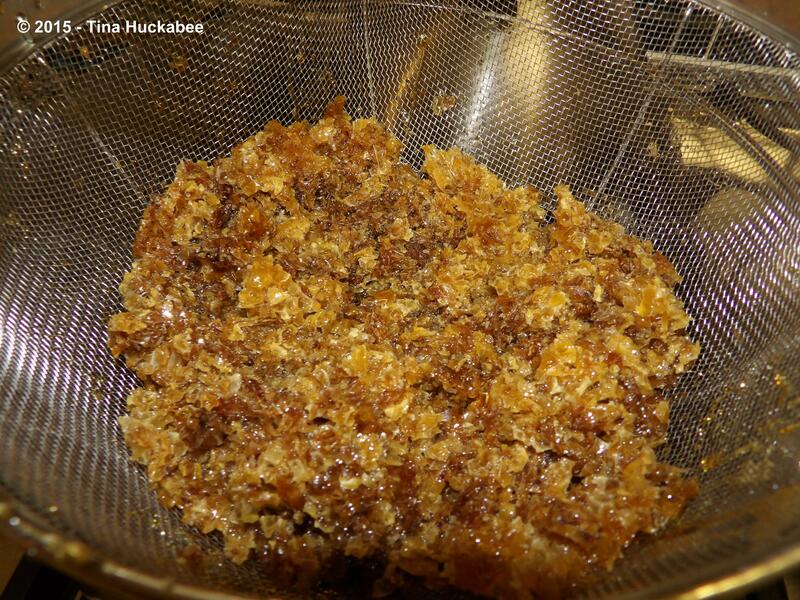 This golden glory is what remains of one of the batches of honeycomb that Bee Daddy and I harvested from our honeybee hives recently and that I drained a total of about a gallon and a half of honey from. I should also add that in addition to being lumpy and squishy, the honey is also sticky and delicious. 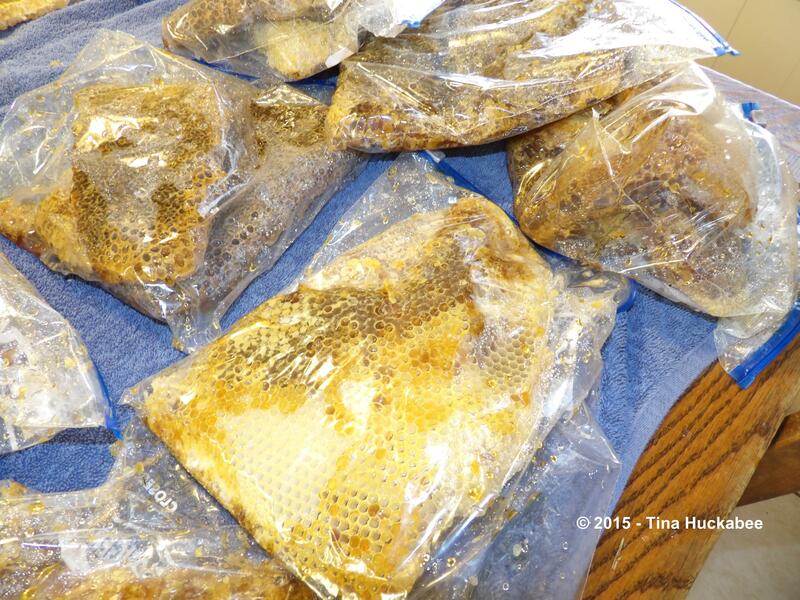 After checking our hives recently, we ended up with bags full-to-bursting with honeycomb which needed squishing in order to extract the precious, yummy honey. If I was a serious beekeeper whose goal was to reap honey throughout the year, I would have a different type of hive (Langstroth) and invest in a honey extractor. As it currently stands though, my beekeeping goals are about adding pollinators to my local environment and if we get some gorgeous and sweet benefit from the bees, that’s a-cherry-on top for our efforts. 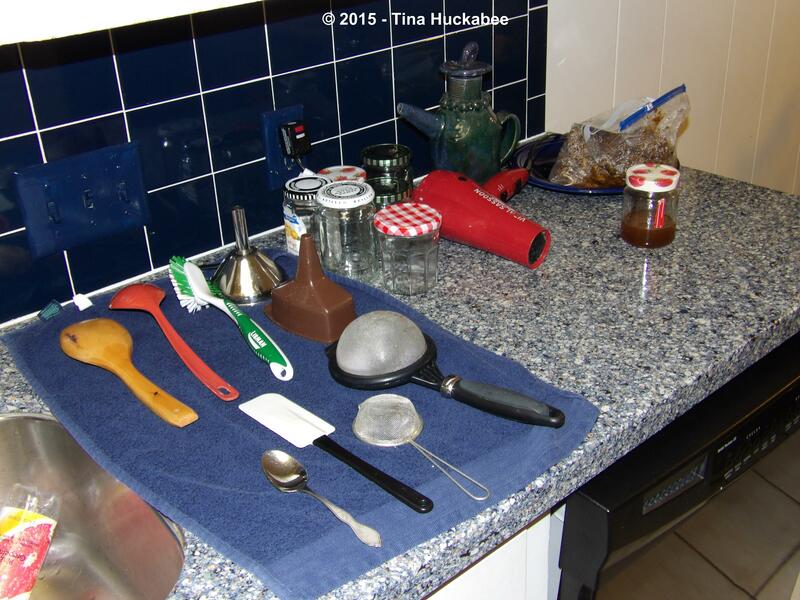 …plus some partially filled comb. Because the extraction is time-consuming (I’ve done this once before after the smaller spring honey harvest), I knew the work would commence over several days, so the first order of business was to store our ziplocked booty. 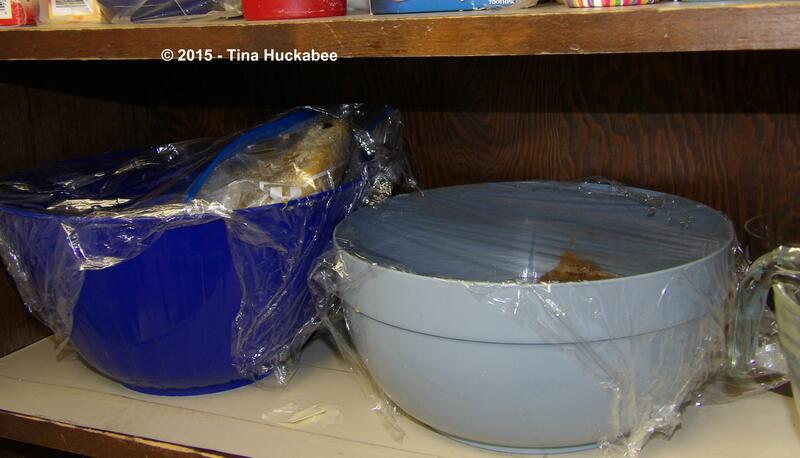 I placed the bags in bowls and cookie containers and made room on pantry shelves throughout the kitchen. If we had Langstroth hives, the comb would be built in an actual frame that we could place in a spinner to extract the honey. Our Warre hives demand that the comb be cut out in its entirety in order to extract the honey. 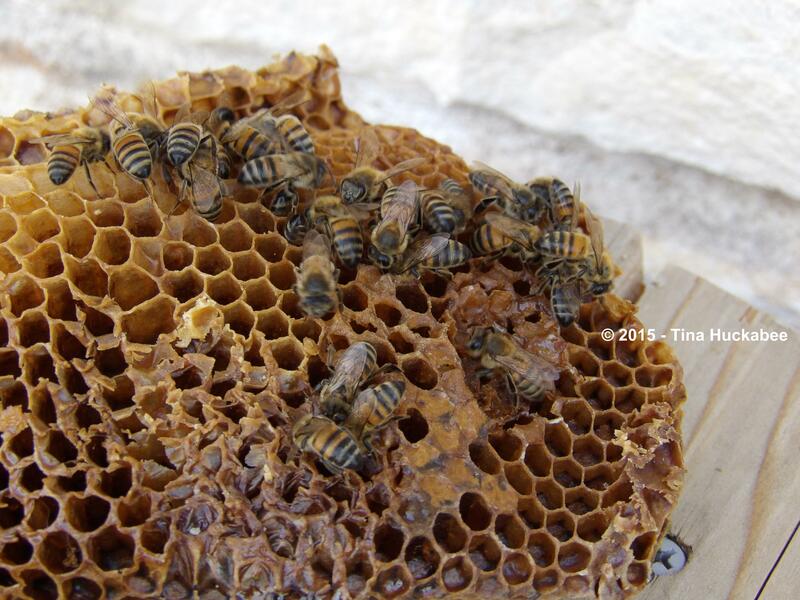 The Warre hive is designed with top bars and the bees build their comb downward from the bar. Once the bar is removed from the hive, the only option is to crush the comb to open up the cells and let the honey drain and drip. Which is what I did, on and off, all last week. In batches, as I found time, I broke off bits of comb, place those bits in a strainer then proceeded to crush the comb with a solid wooden spoon as my patience and wrist allowed, then let the released honey drip at its pace through the strainer into this large glass bowl. Sometimes I left it dripping overnight or set it up the dripping mechanics first thing in the morning while I was gone during the day. Once I was weary of the crushing and there was a reasonable amount of honey in the bowl, the more beekeeper-intensive and time-consuming part of the process ensued. 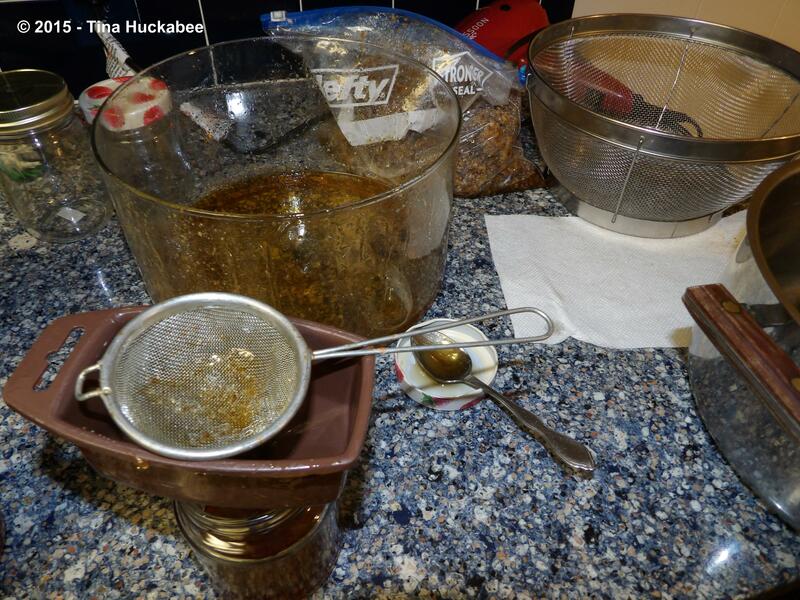 I’d warm the honey for a few minutes by setting the bowl in a large dutch oven with about two inches of heated water, then pour honey through two different tea strainers nestled in funnels, which emptied directly into former salsa, preserve, and jelly/jam jars. The first pouring or two typically went well and fairly quickly, then the strainers would clog up with honey detritus, like bits of wax which survived the first straining round. 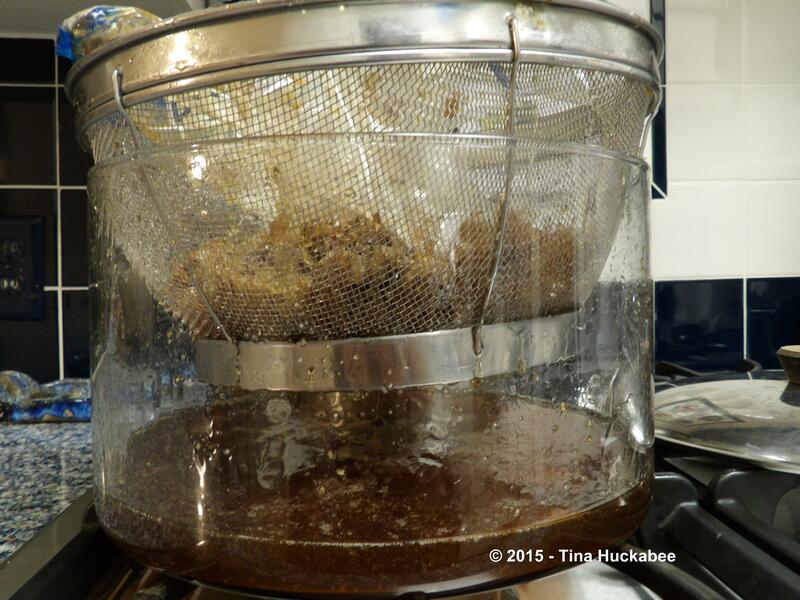 I’d wash the tea strainers to clear the netting, situate the strainers back into the funnels, pour more honey through until I’d finished the batch of honey. A bag crushed completed, bottles filled with sweet amber gold, I’d dig into another bag, crush more comb, wait for the draining honey, and commence straining and dripping. And so it went for several long, sticky days. It took most of the week in on again/off again honey work to finally achieve 18, 12-14 ounce jars of honey. By the time this photo was taken, we’d already given some away and delved into a jar ourselves. Yummmm. Fabulous honey on homemade buttered biscuits, on warm whole wheat toast, and occasionally on a spoon, directly into the mouth…. Yes, I need to be walking and biking more. 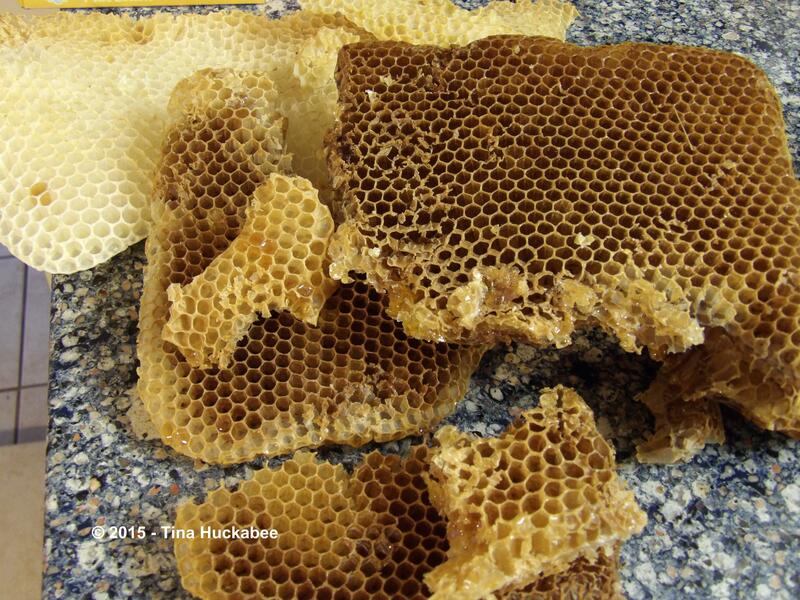 Once most of the honey was extracted and bottled, with plans for eating and gifting, what to do with the honeycomb? I’m bothered a bit by the destruction of the comb because it’s so beautiful and so perfect. It feels wrong to destroy such beauty, but destroy I must if the honey is used by anyone but the bees. It’s very early spring here with not too much in bloom just yet. I’d started feeding my bees about a week before we checked the hives because I didn’t realize how much honey was left and I will continue feeding for a week or two more, before spring busts out all over, in full floriferous fashion–to assure the hive has strong start to their brood and growing season. I decided rather than simply throwing the crushed and abused honeycomb in the compost (which isn’t a horrible idea) I’d set it out for the bees to eat. 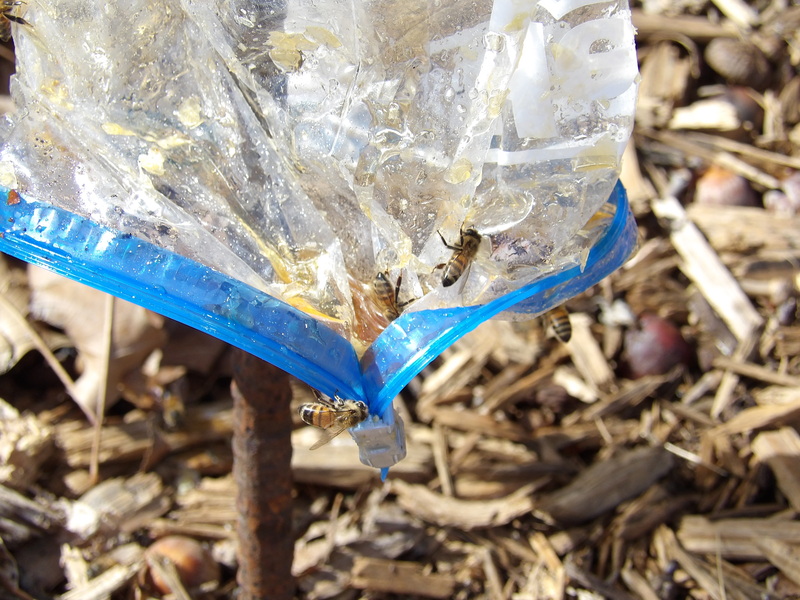 …filling their abdomens with sweet , gooey goodness and returning to their hives with to do what honeybees do. ..and over ceramic yard art. 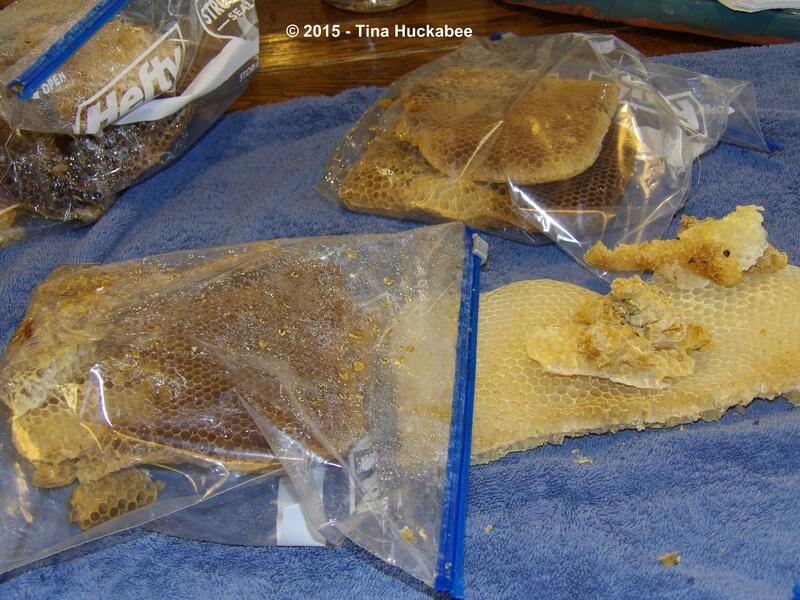 I also deposited the bits of broken comb on top of the hives. Except for some very cold days this week in which they stayed warm and cozy in their hives, the bees have worked that honeycomb for honey and are still doing so, though it’s turned cold again. 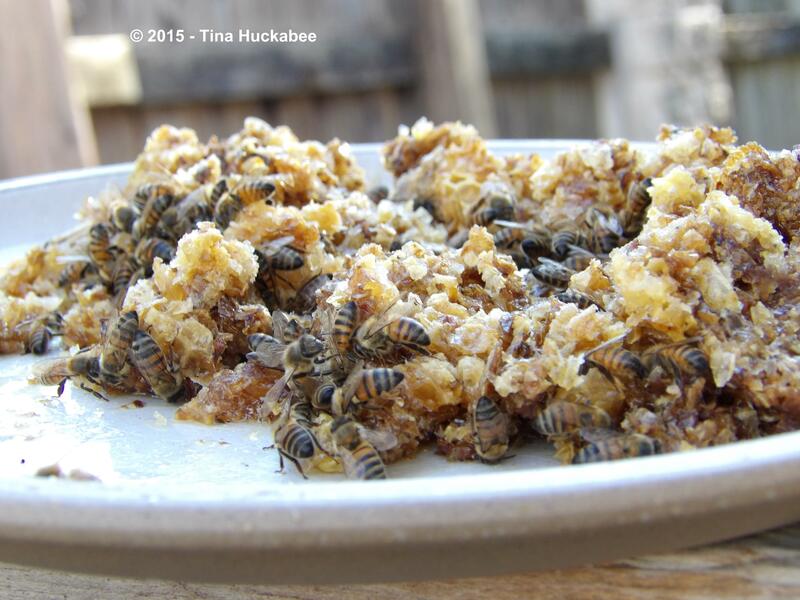 The only thing a beekeeper should feed her bees is white sugar/water mixture and their own honey. For now they’re getting their own beautiful honey to enjoy and take to their hive for strength, endurance and because they’re honeybees! 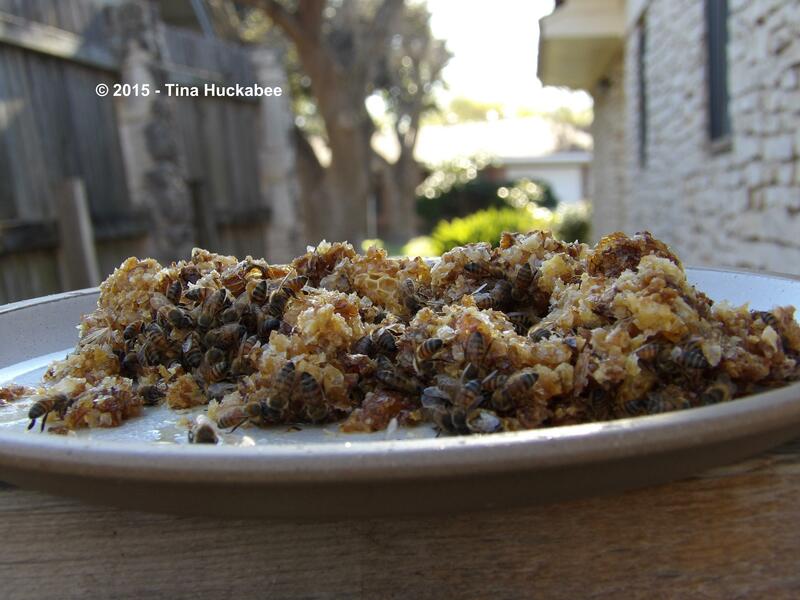 The bees can’t reuse the wax, though they are excellent recyclers in so many other ways. I’ll leave the comb out, crushed and otherwise, until the bees lose interest in teasing out remaining honey, or eat what honey is there. 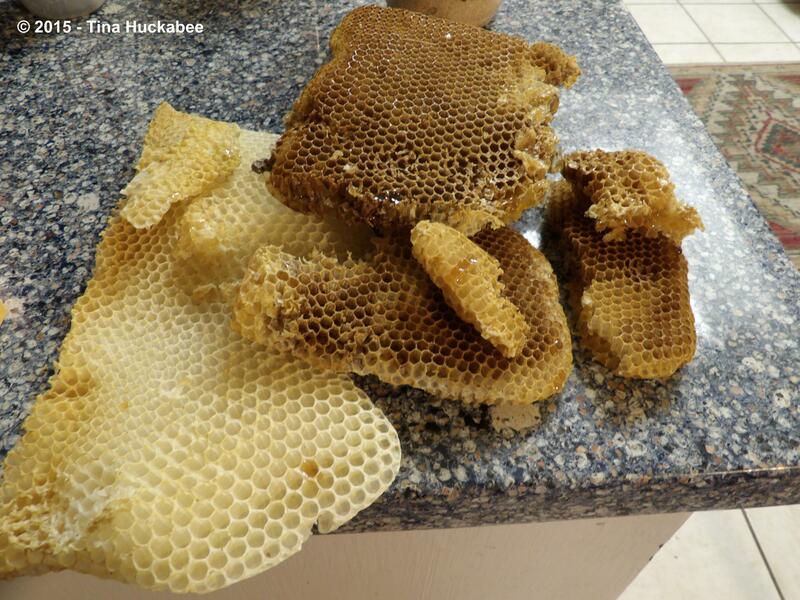 Once the comb is depleted of its honey, it’ll go to the compost. Or maybe I’ll put out a call the the Austin area beekeeper bunch and give it away to someone wanting to make candles–or, the like. No more kitchen comb work for me, at least until the next harvest. And with all those jars of honey tucked away in my kitchen cabinet, I suddenly have all these friends…. 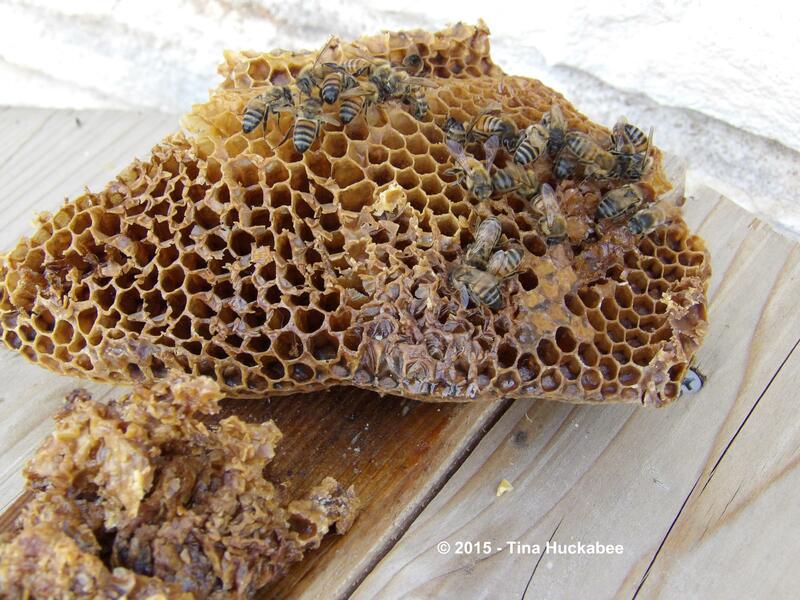 This entry was posted in Beekeeping, Making Honey and tagged Bee HIves, Honey, Honeybees by Tina. Bookmark the permalink. You won the Honey Lottery so it is quite natural to have all those sudden friends and relatives appearing. Perhaps you should fib here and state that, yes you have a lot of honey, but it tastes unusual or off-putting in some way. I bet you’d have it all to yourselves that way though granted, that is a LOT of honey for 2-3 people. Especially with more to come. What a great (and appropriate!) 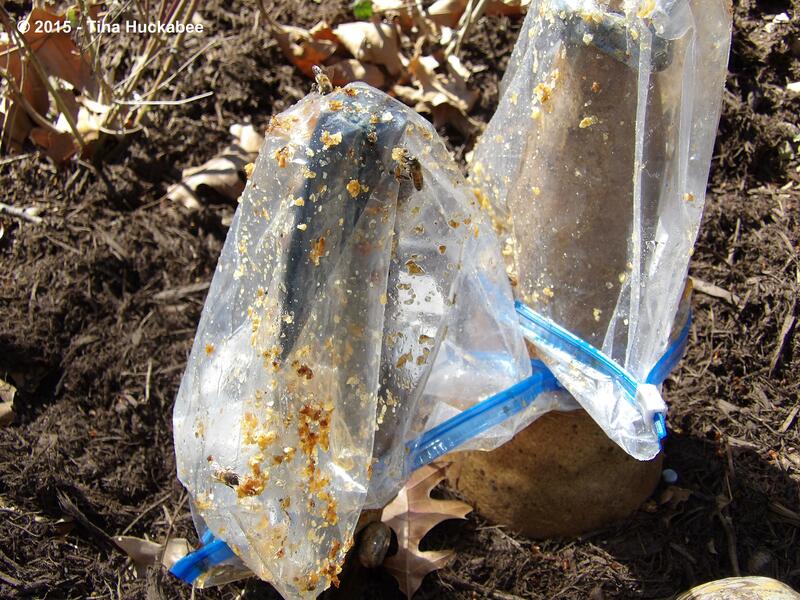 idea to have the bees do that last bit of honey retrieval to their own benefit. Judging by the numbers in your marvelous photos, the bees are in full accord. I recall a shop in California where they had a beehive with a window. 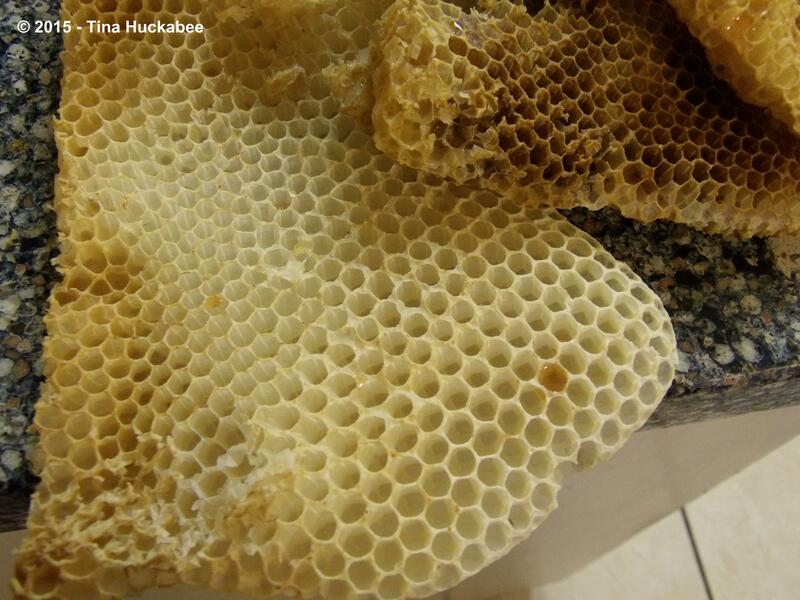 I swear just looking at the honeycomb through the glass made your hands sticky! The shop sold honey and made diminutive candles from cleaned rolled honeycomb. They were gorgeous and burned so cleanly, but honestly I had a hard time putting a match to what looks to me like an engineering marvel. Yeah, it’s really gross. No one would want this honey. Interestingly, when I took a basic beekeeping class at Round Rock Honey, they let us taste several different harvests and indeed, one of the sample (I can’t remember what time of year it was harvested or what plant they said was probably the main contributor to the nectar), but it wasn’t very good. It was eye-opening (or maybe I should say tongue discerning) to have several “types” of honey with such a variety of flavors. I read somewhere that the bees will clean up the comb of extraneous honey, so it seemed like a good idea to set it out: they get to eat, my hands/wrist get to rest. I’m not very crafty, so beeswax candles are not going to happen on my watch or in my kitchen, but maybe I can find someone to do something with the wax. Otherwise, to the compost it goes and I think that’s fine–it’ll be used in a different way. The honey looks so nice and yummy and now the work is done, you can focus on enjoying it. Loved the photos of the bees going after the combs. And we are enjoying, Shirley! I guess that bees like honey, wouldn’t you agree? Insects are really good at cleanup jobs. hahaha Love it. Dumb bee questions of the week coming up: do you notice different colours in the honey — like does the honey made in the spring look and taste differently than what is made in the fall? I assume bees build the comb in a kind of pattern. If you looked at some comb would you be able to roughly guess/date sections? Also. Do the honey bees show any preference for the introduced plants that they co-evolved with? I notice around here they just LOVE the rosemary and quince — as they probably should. But I don’t often see native bees working those same flowers. Yes the honey is different. The spring honey was lighter in color and lighter in taste, if that makes sense. It also wasn’t quite as thick though that could be due to the colder temps in February, compared to those in summer. This batch of fall honey seems richer to me. It’s not better, but it is richer, more luxuriant in taste. I know of course what the bees were gathering in my gardens, but they forage in a three mile radius, so who knows what they brought back. 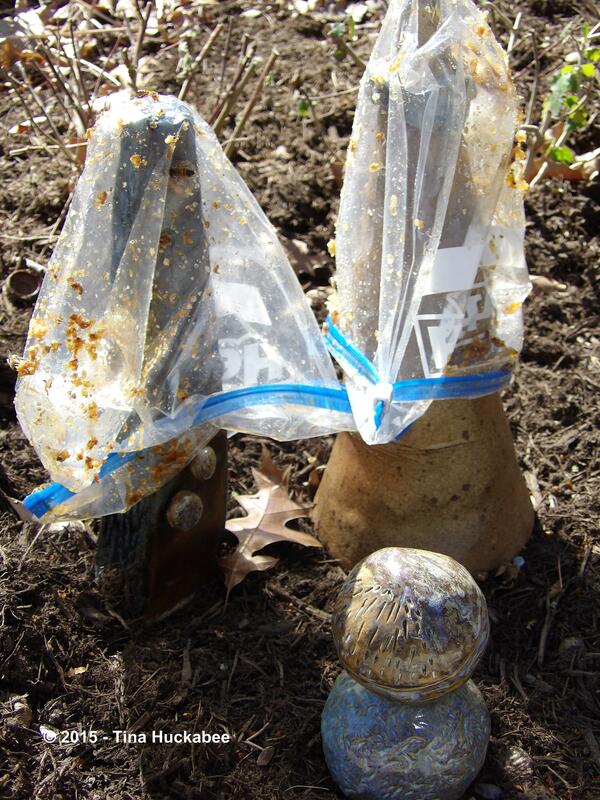 I can and might, send off a sample to A & M and they can test what plants were gathered, or at least, the main plants. Funny story: at one of the beekeeper meetings, someone mentioned that a friend sent his honey off to be tested. I can’t remember what the primary nectar source was (maybe abelia? , something introduced), but the secondary source was cannabis. Several people then asked where they could buy THAT honey…..
As to your comb question. The only way I can tell “age” is that the newer comb (like the honey) is lighter in color. In this extraction, I suspect (though I haven’t researched it) that the darker comb we removed was comb that had honey that the bees ate in the cold months. Good question on the choice of nectar sources. Hmmm. I probably haven’t paid that much attention. It seems to me that when I saw honeybees at plants, there were usually native bees too. I don’t recall seeing one kind of bee exclusively on a particular plant. That’s something that I should watch this next year. So much of what I grow is native, with the exception of roses, that I don’t have much to compare in my set of gardens. I think though that on basil and oregano, I mostly saw honeybees, so that would certainly fit in with what you’re suggesting and it makes sense. I’ll keep a closer eye this next year–that’s an interesting question to get an answer to. You’re welcome. I’m glad you brought up the differences between what the honey vs. the native bees visit–I’ll keep better watch. I would love to keep bees but don’t have the space and my HOA would freak out. Grrr….. I’ve never heard of giving the bees their own honey to eat but they seem to be feasting! The bees here are still sound asleep. Great post! Maybe your HOA should be reminded that bees (native and otherwise) pollinate 80-90% of the world’s food crops and that if they disappear, we’re in deep doo-doo. 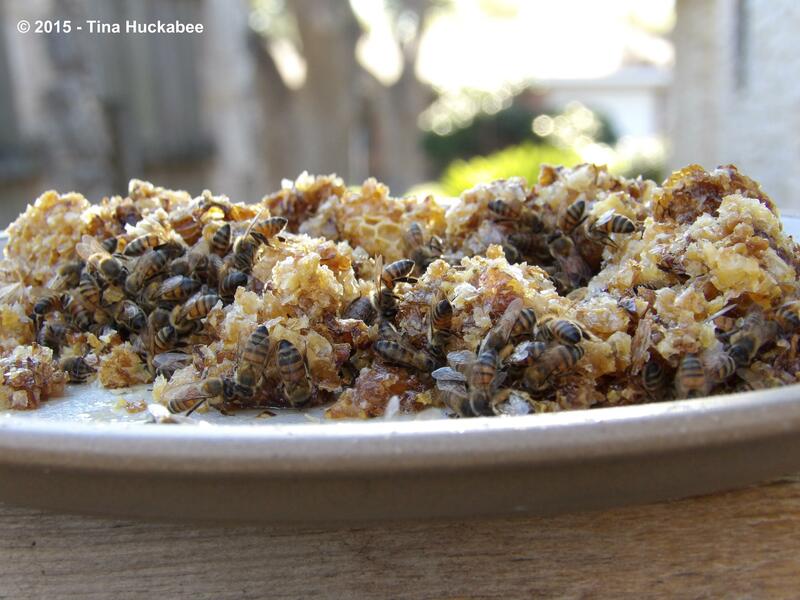 They love their own honey–that’s why they make it, to survive on during inclement weather. I’m sure your bees are sleeping, but spring will come. Soon. 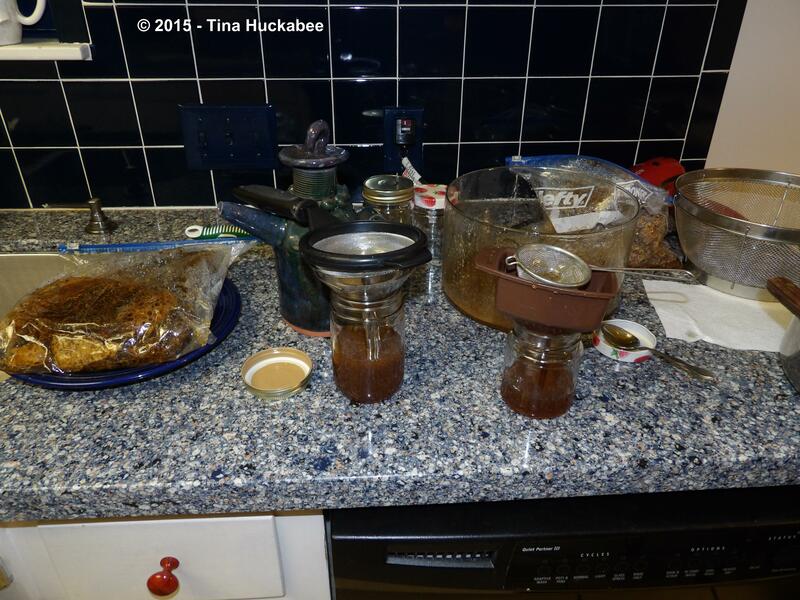 Tina I would have already been over to help so I could possibly get a jar…..I would work for mine like the bees….I love how you gave the mashed comb and leftovers back to the bees….that is fabulous. They’ve enjoyed the mushed honeycomb. 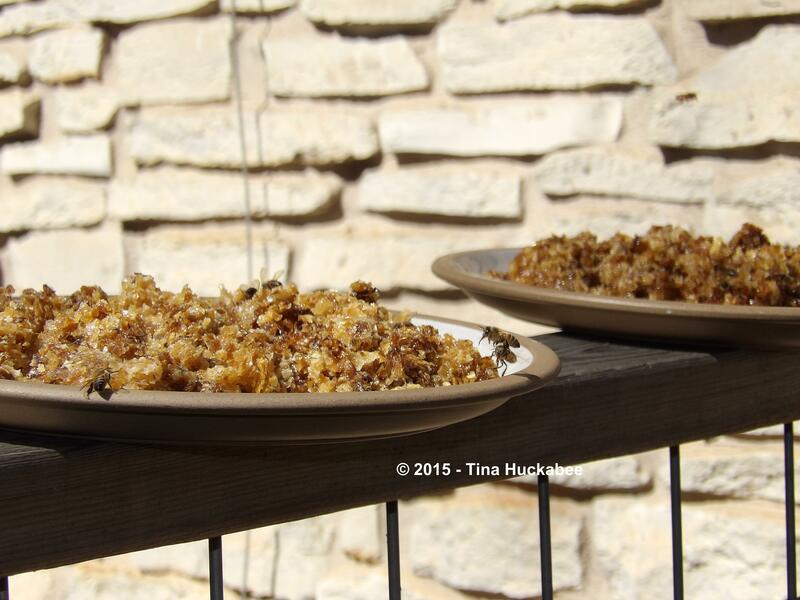 I’ve put the plates on the back covered patio because we’re in freezing/raining mode for the last 24-48 hours, but I’ll put the plates out again once it warms and the bees venture out again. I’ve enjoyed learning too-it’s been quite a trip. Wow – quite the ordeal you had to go through to get to the sweet golden treat! 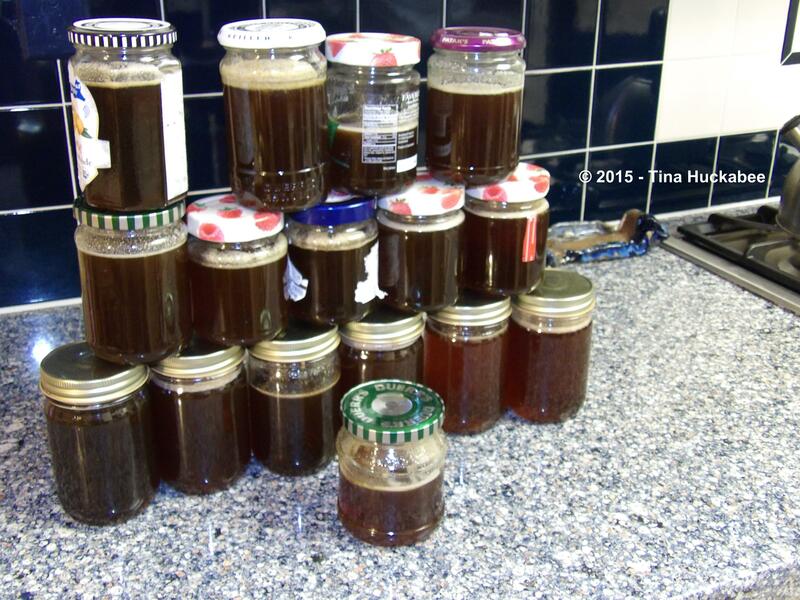 I bet the honey is absolutely mouth-watering – congrats on your delicious harvest! I’d love to keep bees one day…one day when I have A LOT more time on my hands. 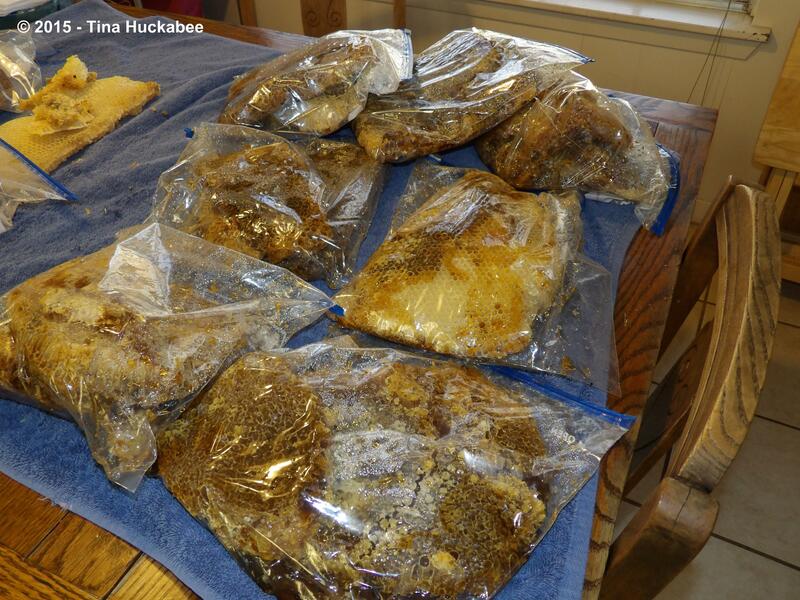 It certainly looks like quite a lot of work to do it right – so I’ll stick to purchasing the gooey sweetness for now. 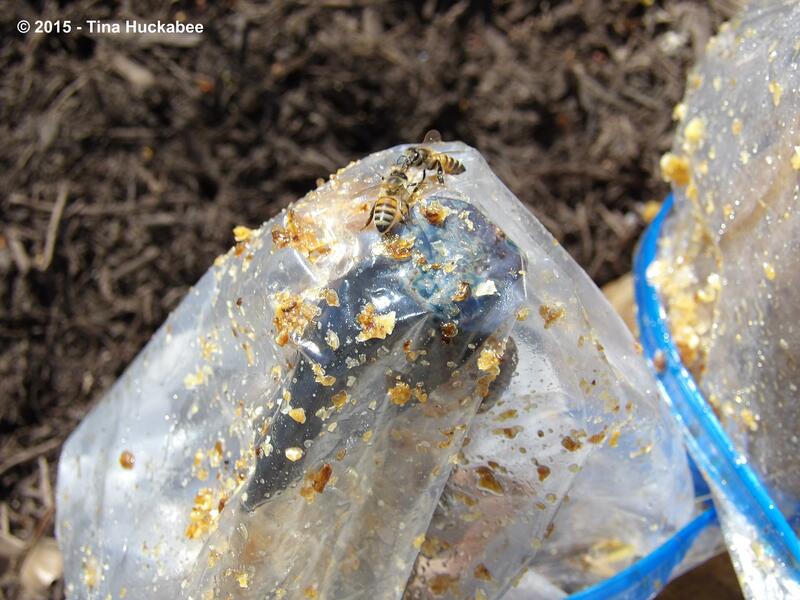 In general, the bees don’t require much time–we check them once a month or so. There’s been a big learning curve though, lots of reading, attending meetings, asking questions, screwing up, then desperately attempting to fix our mistakes. Gee other than that, they’re not much trouble at all. The honey extraction though is very time consuming. And sticky. I view keeping bees like I view my pond–it’s work, but I’ve integrated it into my life and gardening experiences. I think it’s been quite rewarding.